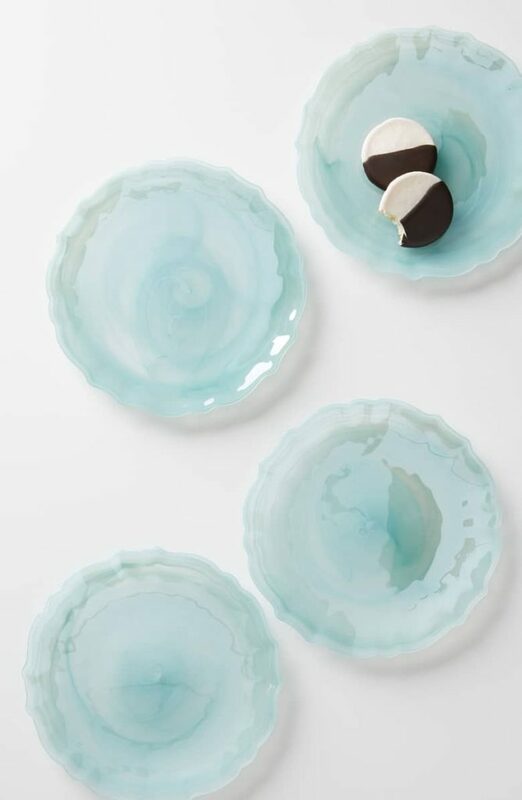 A ruffled edge and swirls that show through the glass make these Quant Set of 4 Glass Dessert Plates in Turquoise sweet enough to showcase your best desserts. $40 Sale $32. Free shipping. Buy here. 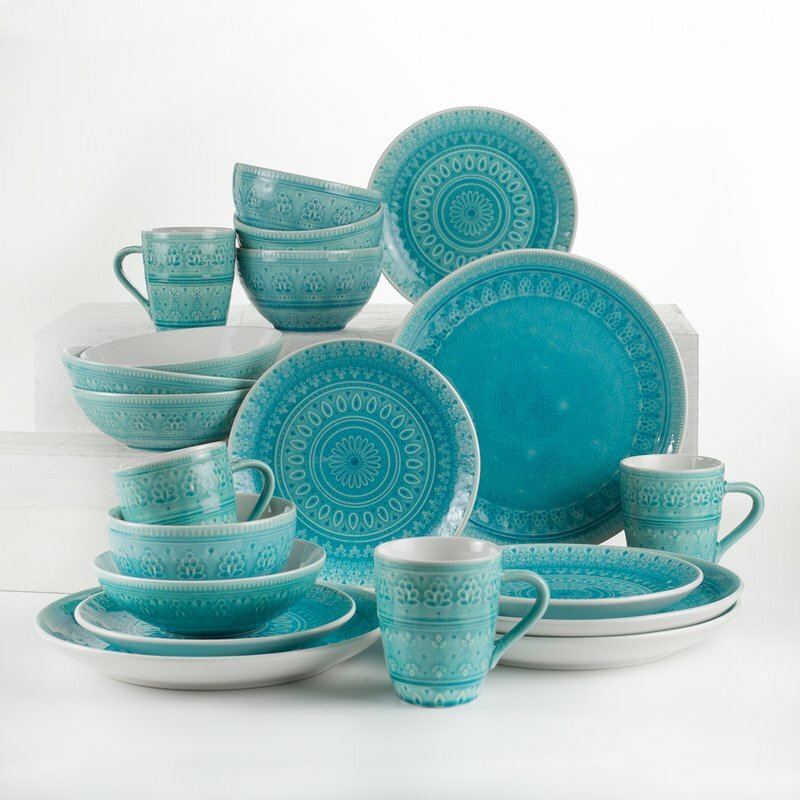 This Turquoise Halsey 20 Piece Dinnerware Set features a unique design inspired from the south of Spain region. 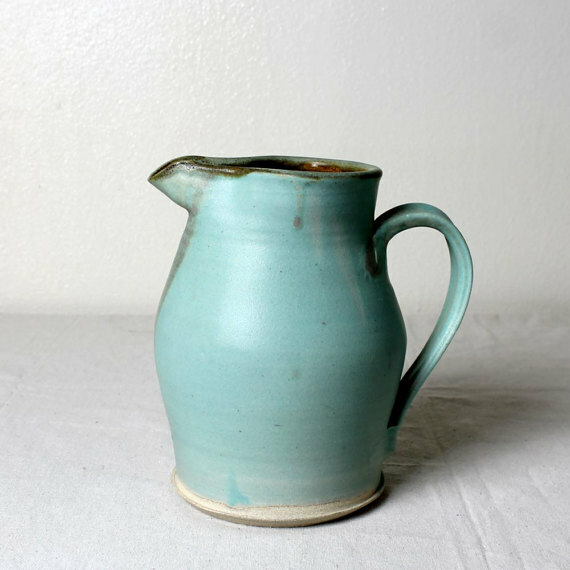 Finished with a reactive crackle glaze. Offering durability and practicality, it is made of stoneware and is dishwasher and microwave safe. $105.99. Free shipping. Buy here. 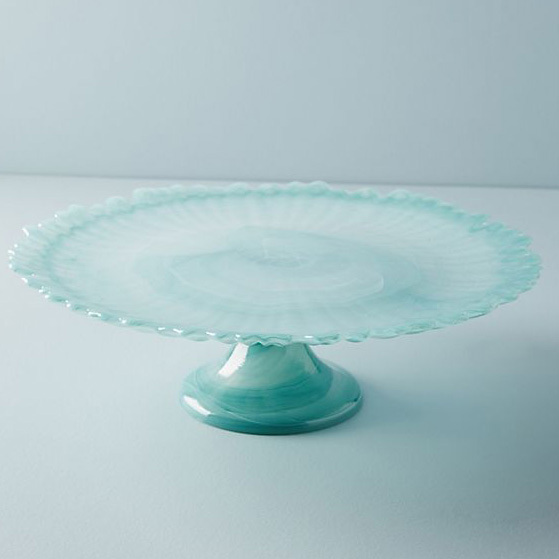 This beautiful Alma Cake Stand in Hawaiian Blue is made from soda lime glass. Made in Turkey. 4″H, 13″ diameter. $28. Buy here. 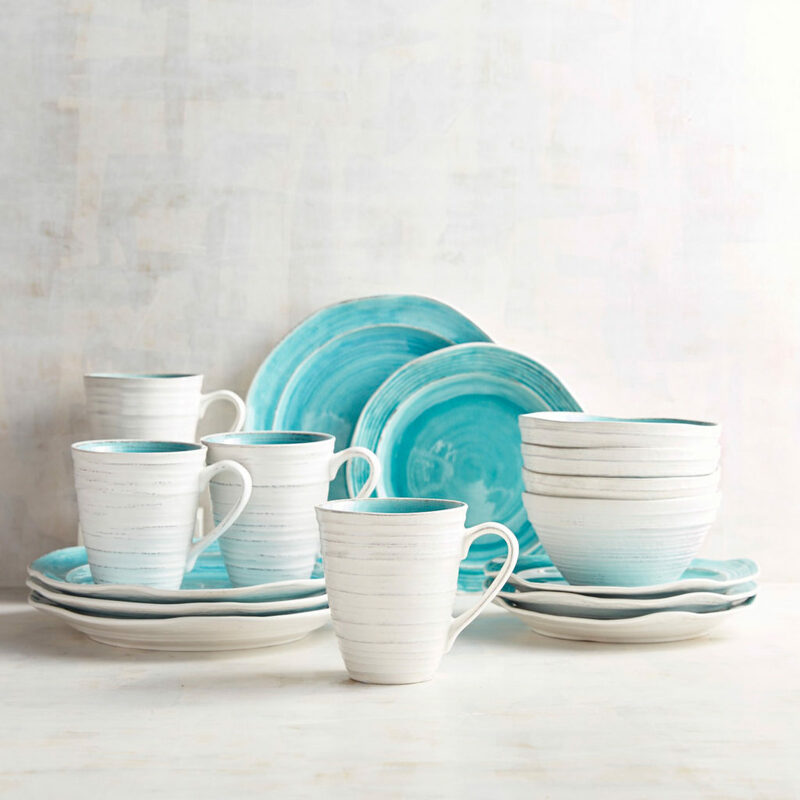 The glazed stoneware pieces of this Midori Turquoise 16-Piece Dinnerware Set have been carefully crafted so their irregular surfaces and rubbed edges can grace your table with the look of rustic pottery. Happily, the collection is dishwasher-safe, so it’s ready to set for both daily meals and special occasions. $129.95. Buy here. 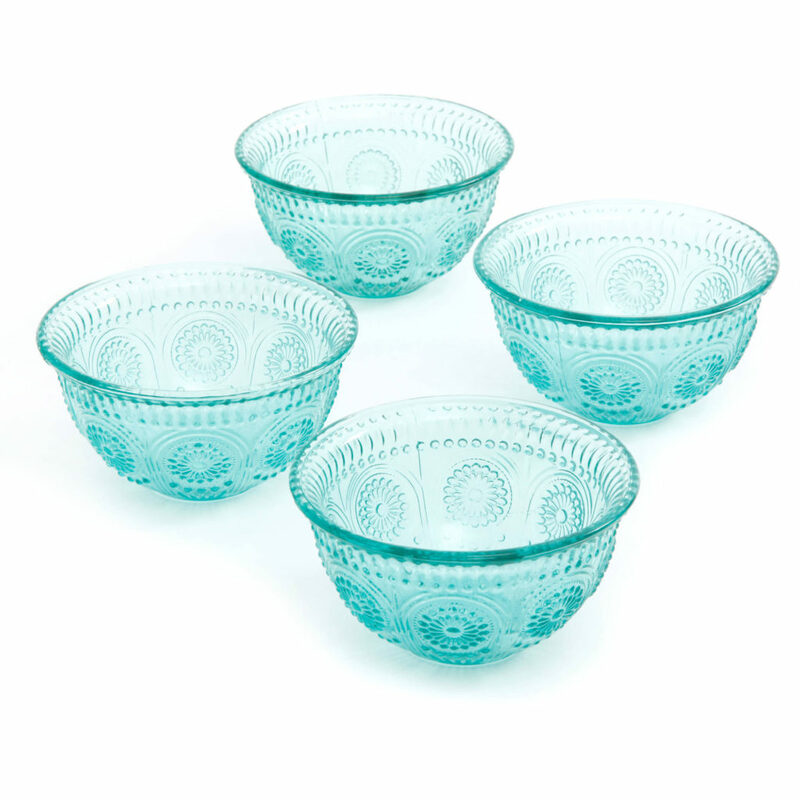 This stunning 4-piece Adeline Emboss Glass Bowl Set from The Pioneer Woman features strong statement pieces made of durable, embossed pressed glass. Decorative and functional, the beautifully embossed bowls are perfect for favorite meals, snacks, and desserts. Set includes four 13-ounce glass bowls. $32.50 Sale $15.68. Buy here. 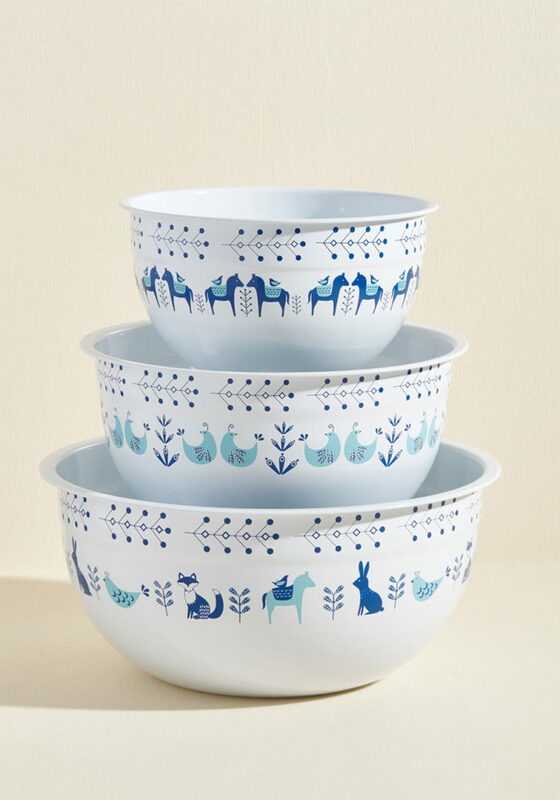 This Kitschy Kitchen Enamel Mixing Bowl Set includes a trio of nesting vessels all with sky-and-navy blue Scandinavian patterns featuring horses, partridges, and bunnies. $44.99. Buy here. 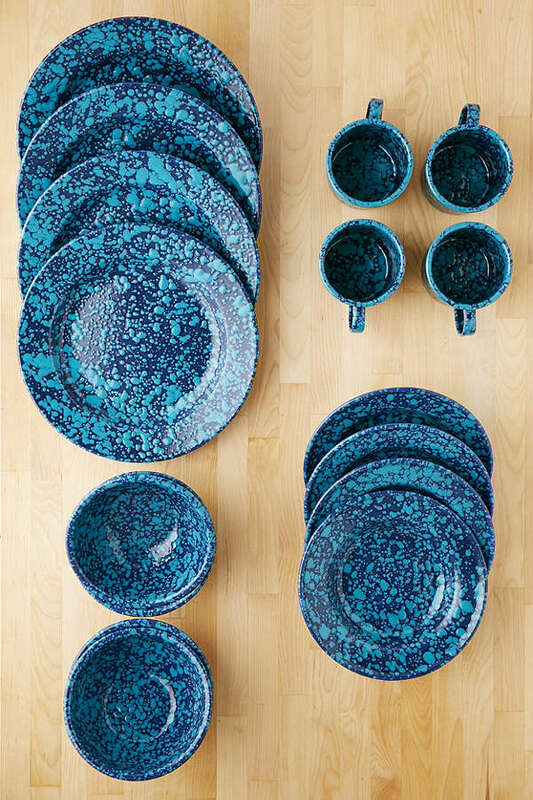 Next to plain white dishes, this richly colored Cambria 16-Piece Dinnerware Set in Turquoise Blue brings warmth and appetizing ambiance to every meal. The glazed stoneware with visible natural undertones and rubbed edges is handcrafted in Portugal with an artisan-made look and feel. 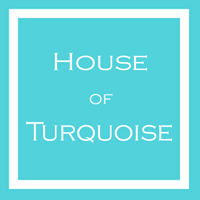 Choose a single color or make it fun by layering mixed colors according to the mood and menu. $136 Sale $108.50. Buy here. 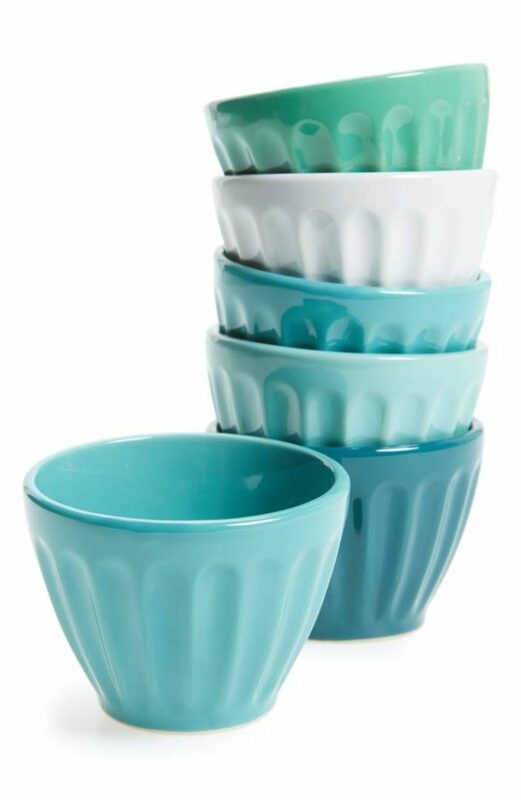 As versatile as they are lovely, this grooved, debossed Set of 6 Mini Latte Bowls are dishwasher and microwave safe. $20 Sale $11.98. Free shipping. Buy here. 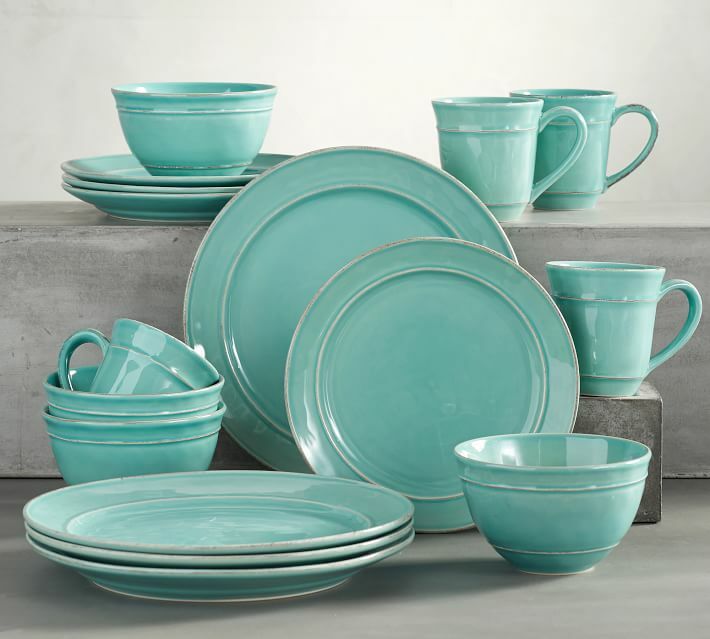 The classic Crow Canyon Home essential Teal 16-Piece Speckled Enamelware Starter Kit in UO-exclusive speckled colors! 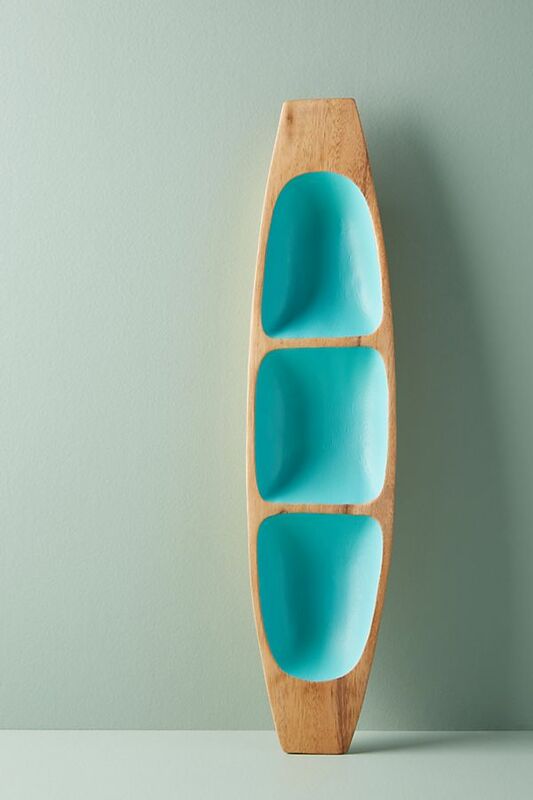 Made with the high-quality craftsmanship they’ve been creating from their San Francisco base for over 40 years, this all-you’ll-ever-need set of dishes includes four of everything: mugs, salad plates, bowls + dinner plates. 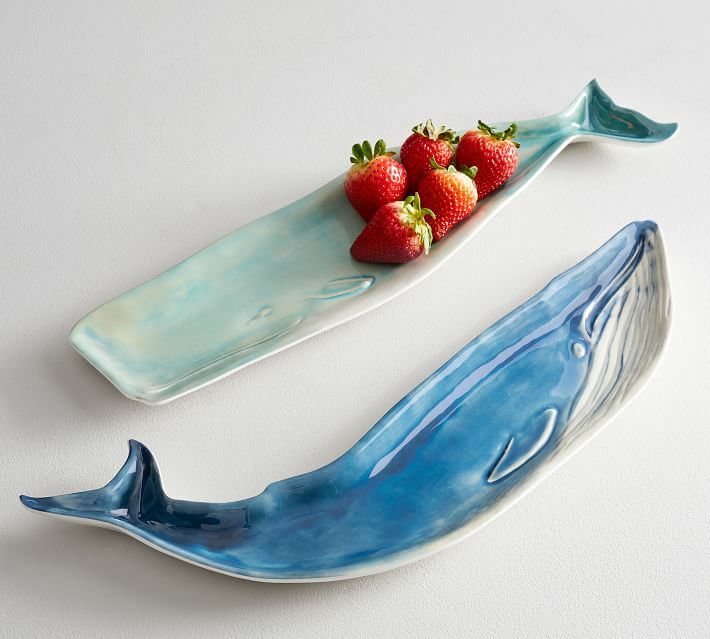 Crafted from carbon steel coated with porcelain enamel, these pieces are built to last and are oven, freezer + dishwasher safe, too! $129 Sale $105. Free shipping. Buy here. 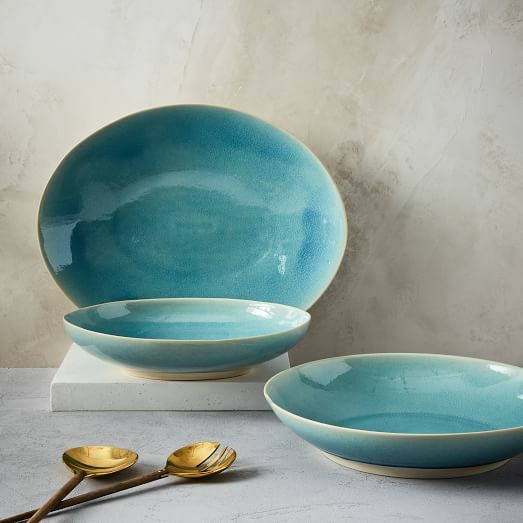 Showcase your rockin’ style with this unusual Katalla Bay Ceramic Dinnerware in rich shades of teal, taupe and glimmering gold. A beautiful way to set a table that displays nature’s gifts. $7.95 – $8.95. Buy here. 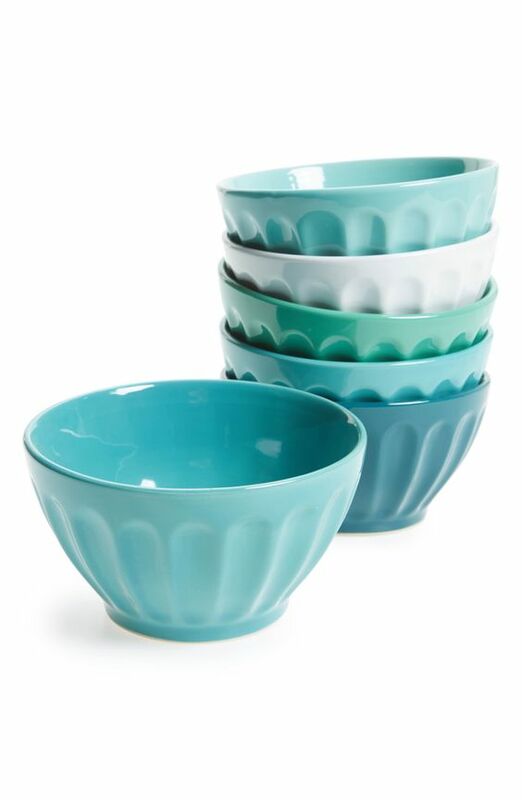 As versatile as it is lovely, this grooved, debossed ceramic Teal Set of 6 Latte Bowls is dishwasher and microwave safe. Holds 21 oz. $30. Free shipping. Buy here. 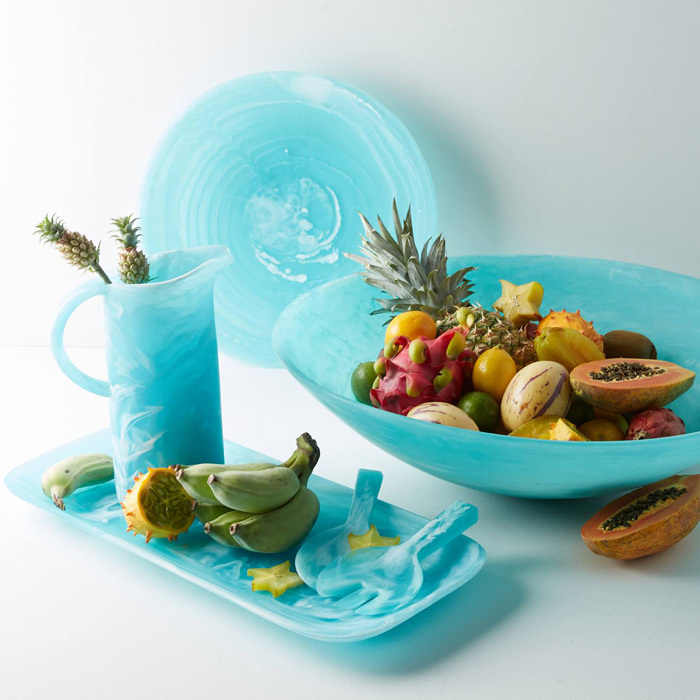 This vibrant, handcrafted Nashi Home Aqua Swirl Serving Collection is versatile enough for the dinner table and stunning enough to place on display. Handmade in Australia. $50-$298. Buy here. 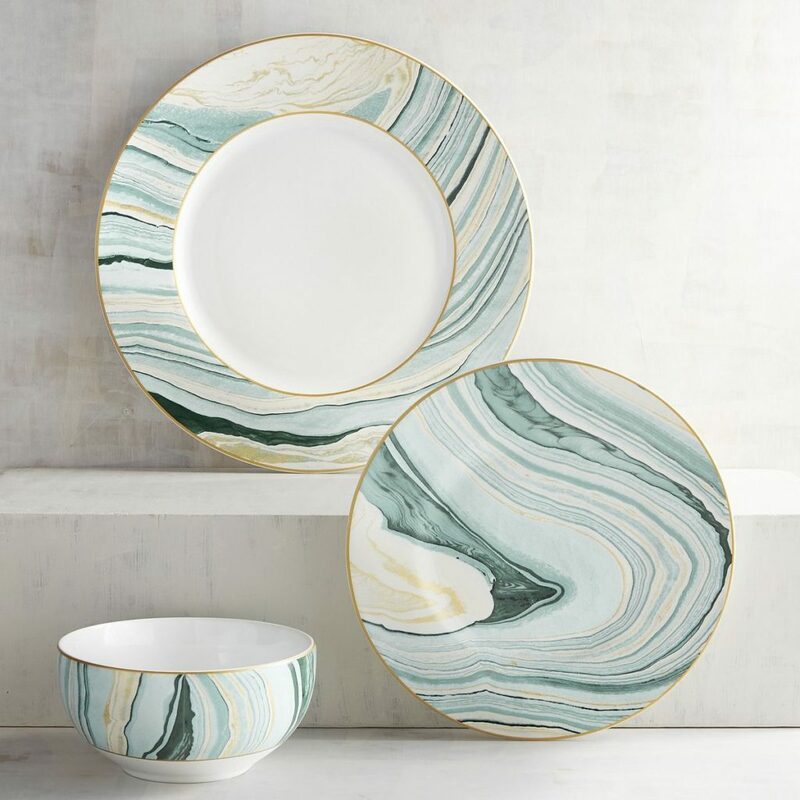 With its unique crackle glaze and subtle ombre effect, this sturdy Alta Crackle Serveware transitions from everyday entertaining to special occasions in an instant. Best of all, they’re safe to use in the dishwasher and microwave. $29-$44. Free shipping. Buy here. 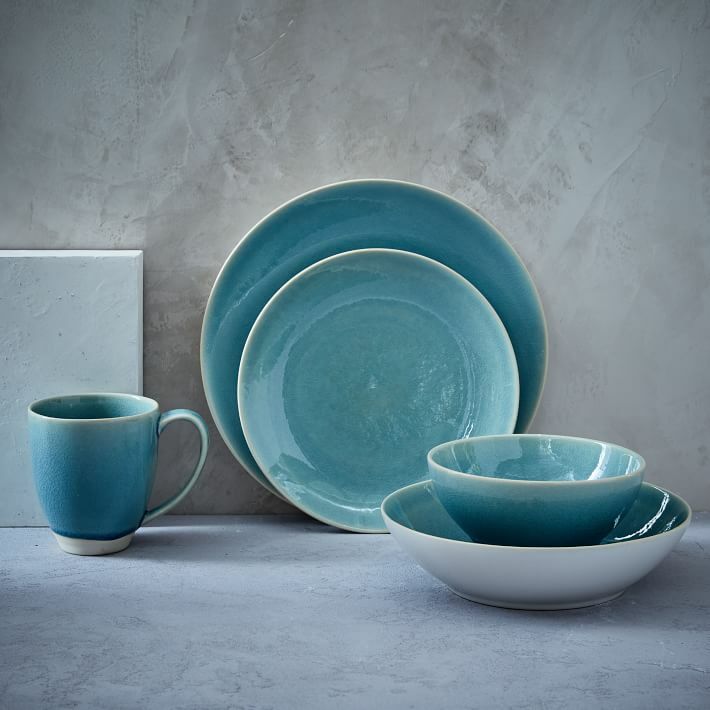 With its beautiful crackle glaze finish and subtle ombre effect, this couped Alta Turquoise Crackle Glaze Dinnerware Set is everyday dining at its finest. The best part—it’s dishwasher- and microwave-safe. Sold as sets of 4. $24-$32. Buy here.